Little academic research has examined the challenges humanitarian actors face or the strategies they develop in the increasingly numerous authoritarian and low-intensity conflict settings. 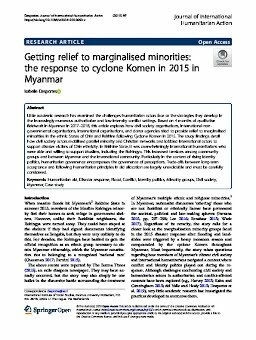 Based on 4 months of qualitative fieldwork in Myanmar in 2017–2018, this article explores how civil society organisations, international nongovernmental organisations, international organisations, and donor agencies tried to provide relief to marginalised minorities in the ethnic States of Chin and Rakhine following Cyclone Komen in 2015. The study findings detail how civil society actors mobilised parallel minority and Christian networks and lobbied international actors to support disaster victims of Chin ethnicity. In Rakhine State, it was overwhelmingly international humanitarians who were able and willing to support Muslims, including the Rohingya. This increased tensions among community groups and between Myanmar and the international community. Particularly in the context of rising identity politics, humanitarian governance encompasses the governance of perceptions. Trade-offs between long-term acceptance and following humanitarian principles in aid allocation are largely unavoidable and must be carefully considered.